Cabinet re-facing is a great way to give your kitchen a face lift without going to the hassle and expense of buying all new cabinets. In this case the cabinets were primed and painted; the previously painted formica counter was painted and re-sealed to look like bluestone; and a "copper" backsplash was created with a translucent metallic glaze over a base color. Scroll over the bottom of the large picture box to see a brief description of each photo. The cabinets in this cottage kitchen were still in really good shape considering they were built with the house in the 1950s. 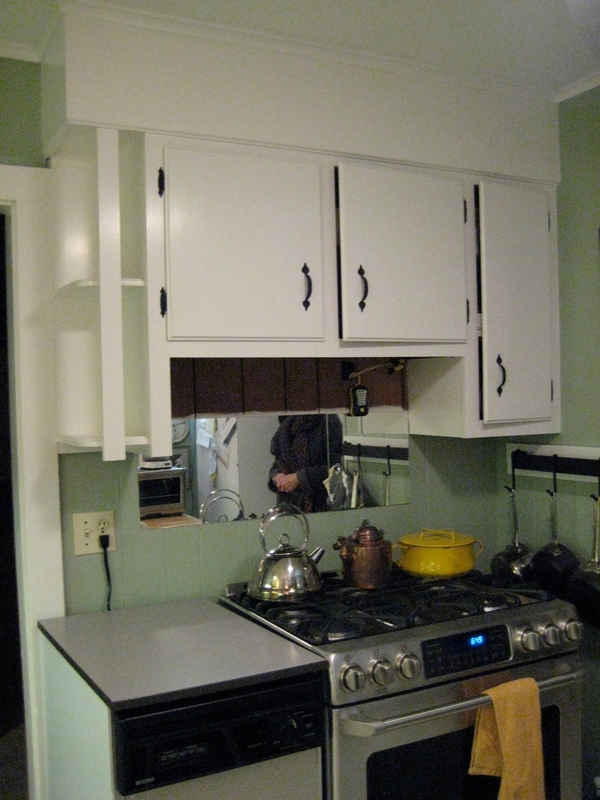 The stove cabinets were custom built to fit over the range and in a small corner with a handy bookshelf on the end. Refacing the cabinets in bright white paint and spray painting the hardware in enamel black gave them a fresh look without having to replace them entirely. The Formica counter had already been painted white once before, so we decided to re-paint and seal it again and meanwhile change the color entirely to resemble soapstone. With the cabinets refreshed, the hardware rejuvenated, and a new look for the counter, we still felt something was missing. The under-cabinet area had been painted in the same sage green as the walls, but it was unsatisfying under lamp light. The client had seen a magazine spread showcasing a copper backsplash and we set out to recreate it with paint and glazes. This photo shows the grooves in the old paneling being filled. Some work remained to be done with the lower cabinets, but with the new hood in place, the cooking area was transformed. Viewed from the Dining room, the copper glaze picks up the lamplight and brings a warm glow to a much brighter space. The entire project took about three days and cost about $1,000.